GRAND ISLAND drivers know that their alternator generates electricity to run the engine, all of the electrical systems, and to recharge the battery. Your serpentine belt spins the alternator to create the of electricity. Until recently, the alternator was always spinning while the engine was operating. Now some alternators come with overrunning pulleys. There are two layouts of overrunning pulley systems – we won’t make a distinction here, but will simply refer to them as “overrunning style”. 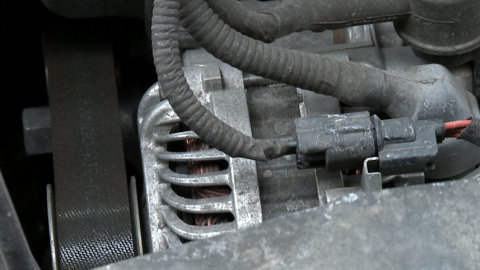 Your serpentine belt winds over and around pulleys linked to the engine accessories, including the alternator. Overrunning style alternator pulleys are able to disconnect from the alternator allowing it to “coast” when the engine is decelerating. This allows the alternator to be at rest some of the time, which, of course, means the alternator will last longer. Overrunning style alternator pulleys provide additional vibration isolation for smoother engine performance, increased gas mileage and increased belt life. They reduce overall wear of all of the engine accessories. If overrunning style pulley replacement is necessary, the alternator will be checked. If the alternator is still good, only the pulley needs to be replaced, saving a good chunk of cash. This type of alternator is swiftly becoming standard equipment on new autos in GRAND ISLAND. The critical benefits of increased fuel efficiency and reduced wear to the overall accessory drive system are compelling. Your experienced Whitaker Auto Repair technician can help you with all of your starting and charging issues. The expert technicians at Whitaker Auto Repair in GRAND ISLAND can inspect, diagnose and correct alternator, battery, and starting systems. At Whitaker Auto Repair, we install quality NAPA replacement parts. You know that your battery stores electricity – enough to start your engine and get you moving. But that’s about it – you can only get a few miles in GRAND ISLAND on battery power alone. You need an alternator to generate enough electricity to run your engine and power your electrical accessories like the stereo, power seats, heater fan, on-board computers, and so on. On top of that, the alternator needs to recharge your battery. So when your alternator isn’t working properly, there isn’t enough electricity for all of those things. When your alternator fails, you aren’t going very far. There’s no sense in hobbling along with an alternator that’s not working properly. It will fail at some point and leave you stranded. Get a bad alternator replaced as soon as you can. Your GRAND ISLAND NEBRASKA service technician at Whitaker Auto Repair will install an alternator that meets your manufacturer’s specifications. Some folks use a lot of additional electrical gizmos in the vehicle, like computers, DVD players, power inverters and such or may regularly tow a camp trailer that’s battery recharges as you drive. If that sounds like you, talk with your GRAND ISLAND service advisor at Whitaker Auto Repair about upgrading to a more heavy duty alternator to meet your needs.